This body of work, Memories Push My Pencil, came out of an earlier project of crafting boxes from basswood based on childhood memories. The creation of these boxes led me to further explore my relations with animals and with drawing itself. During the process of drawing I learned that the quality of the line revealed and intensified a sense of intimacy with the creature. Some of the animal’s qualities are conveyed through the type of line drawn: long flowing marks, short dark marks, curving lines or deep color. I have chosen the portrait format for these large-scale images to elevate the importance of the creature to that of a family member. These portraits honor the significance of my relationship with animals from my life on the farm and my current life by the ocean. Memories push my pencil. 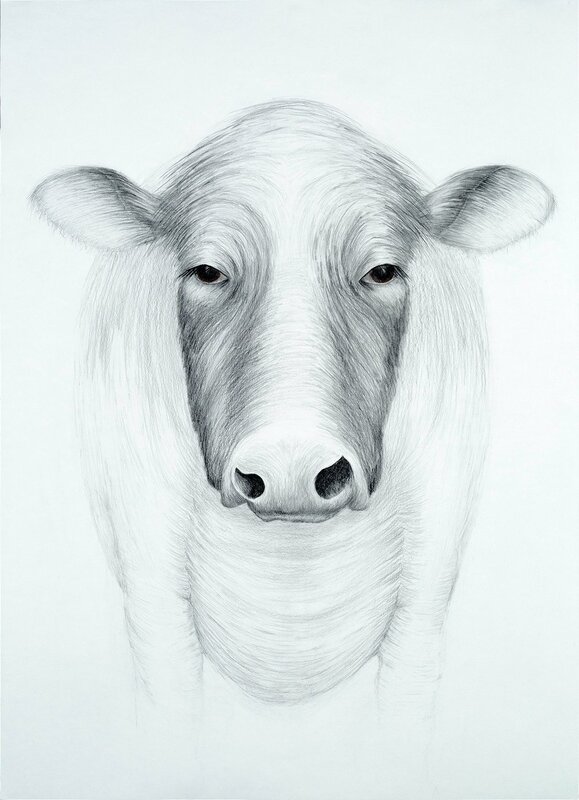 Each line, each mark of the graphite connects me to a time and place from my life on a farm in Indiana where isolation surrounded me. In search of a relationship I could trust, the farm animals provided me with ears to hear what was in my heart.